There are many applications that can create social stories, books, AAC grids, or activities; but which applications can do all in one? Tapikeo can! With an easy to use interface and the ability to record audio, Tapikeo is one of a kind! Continue reading for my review as well as a giveaway of this all-inclusive application! This is where application play via a grid will appear. This is where you can edit a board already created. Press on a square to choose a picture, record a sound, jump to another grid, delete the grid, copy a cell, edit text, or add a new page (up to three). Pressing the "Grids" button will allow you to see the boards installed on the application, your exports, and a guide on how to use the application. If you would like to choose a grid to play, swipe your finger left and right to see the different grids. The one that has a green outline or that you press will be the one used for application play. There are four buttons below the grids - Select and Play, Grid Settings, Delete, and Export. Press select and play to use the grid highlighted for application play. Press "Grid Settings" to change the title of the grid, add a recorded introduction to the board, change the picture outline, or turn on/off 1 by 1 mode. You can get help on how to use this page by pressing the "?" button. It will also show you how many images and sounds are associated with the grid. Pressing delete will ask you if you want to delete the board for you to press "Yes" or "No". Finally, you can press "Export" to compress/create a .tpk file or create a version for a web browser. Then, it will be added to "Your Exports" list where, if selected, you can export by e-mail, import a grid, or delete the grid. You can download additional grids created by the developer or other users. Some of the downloads are $0.99 and others are free. Import a grid by pressing on the file from "Your Exports" menu and pressing "Import Grid". To create a new grid, press the "New Grid +" button at the top right hand corner of the "Grids" page. Type in the title of the grid by pressing within the rectangular space. Then, add sound/instructions by pressing the green "Record" button. Press "Play" to play the recording back. Press "Delete" to delete the recorded message. You can choose to have the pictures outlined in green or white via a toggle switch and toggle 1 by 1 mode on and off as well. Then, press "Add". Next, to place an image on the grid, press one of the squares. First type in the text via the black rectangle. Then, add a picture by pressing "New" to take a picture using a camera or browse to search the camera roll to find an image. You can delete the image by pressing the "x" button by the image. Next, record a sound by pressing the green "Record" button, record a sound or narration, then press the "Record" button again to stop recording. You can play back the recording by pressing the blue "Play" button and "Stop" to stop recording play-back. You can also re-record by pressing the "Record" button or delete a recording by pressing the purple "Delete" button. Press "Edit" on "Jump to another grid" to have pressing the current image jump to another grid. This is useful in AAC. To delete the jump to another grid that you have chosen, press the "Delete" button. To copy an image on another grid to use on your current grid, press the "Copy a Cell" button. Then, choose the grid that hosts the image. Finally, select the image to be copied onto your board. Sound Options - Sounds can be played in order or together. Tap the button to switch between the two. Active Picture - When a picture is active/pressed, you can have the picture have no change, become a larger picture, or become a larger picture and then downsize when a sound ends by pressing the button to switch between these options. Shake Mode - You can enable or disable shake mode by pressing this button. Quick Start Guide/FAQ - Pressing this button will bring you to a guide/FAQ page to help you understand how the application is used. Contact Us - Pressing this button will bring up an e-mail page for you to e-mail the developer with any questions, comments, or concerns. You must have your e-mail installed on your "Mail" application on the iPad for this to work. Share Tapikeo With Friends! - This will bring up an e-mail form to share information about Tapikeo and share a link to download Tapikeo from the application store. Grids Sharing - This will bring you to a website where you can share grids with other users or download new grids created by other users. Rank Tapikeo HD - Pressing this button will bring you to the iTunes App Store to review Tapikeo. About - This page will give you information about Tapikeo, its history, the version, and the developer (Jean-Eudes Lepelletier who also runs ReviewforDev). Choose a grid to play. Next, press the "Play" button. Then, press the first image if it is in 1 by 1 mode. Otherwise press any button. Use the arrow keys to navigate between images in 1 by 1 mode. Another way to interact with the application is to press on an image and hear its sound/narration. One can press, hold, and move an image onto another linking picture as well. Shake mode starts a timer and plays a sound or narration. The child will be asked to find the associated picture. Once he or she taps the picture, if it is correct, a bubble on the caterpillar will turn blue and a "hurrah" sound will play. If incorrect, the bubble will turn pink and a "buzzer" sound will play. You can also lock grids so that children may not edit them. Do this by pressing the lock at the bottom of the screen five times quickly. This means the edit and settings tabs cannot be accessed. The help screen for any part of the application can be shown by pressing the "?" button. 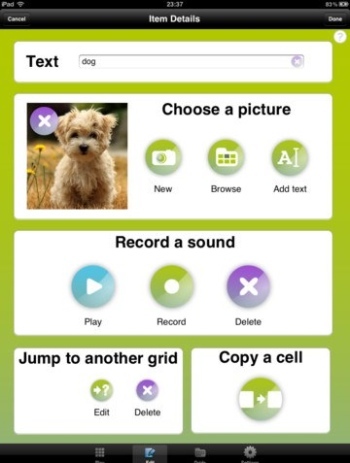 You can make sound grids, social stories, AAC boards, and more with this application! I like that there are so many different things you can create and use the application for! 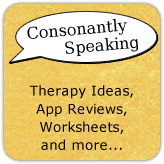 AAC boards, auditory awareness, social stories; the list goes on and on! Creating boards is easy to do and if you have difficulties there are help pages throughout the application with visuals of the pages and step-by-step instructions. There is the ability to share boards with others as well as download additional content via the internet. Grids not only have images but sounds associated with them, which is great for children who do not yet know how to read or have difficulty reading. Feedback on incorrect choices is subtle but seen visually and heard auditorily. There are so many options in the settings menu to customize a grid/activity for the individual. Grids you create will be saved to "Your Grids" to access at any time. You can use your own pictures and create your own audio for boards! I would love the ability to create different grid styles/types (3 bigger buttons on a page, one vertical grid for a schedule, etc.) and to flip between Portrait and Landscape views (but also be able to lock Portrait/Landscape). It would be great to have different ways to view all of the grids so that you do not have to scroll through all of them on the "Grid Manager" page. For AAC grids, it would be great to have a sentence bar at the bottom that you add the words to and can play the whole sentence at once. It would be helpful if there were pre-loaded images on the application to help create these boards. AAC - Create a board to be used for basic AAC by creating boards with basic phrases, people, actions/verbs, wants/needs, places, pronouns, and more. You can create multiple boards and have them jump to another grid for more options. You can also have children who need AAC follow along with a book and press different pages to read one or ask/answer questions about a book. 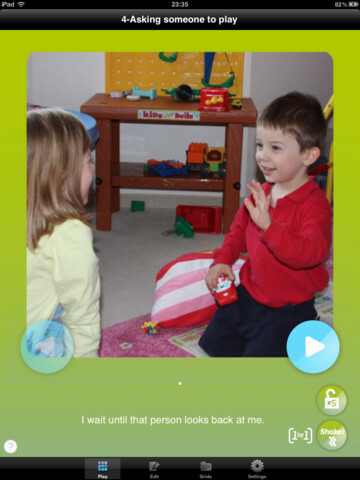 Articulation - Create a word of different images/words with a child's articulation sound to practice. You can even create phrases, sentences, or stories for them to read. 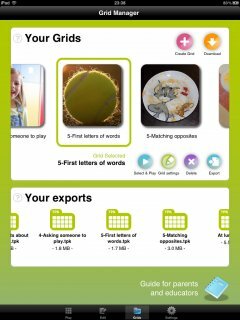 Finally, you can have the child record words and sentences as well as have them played back to hear whether or not they were correct. 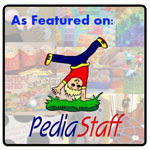 Auditory Awareness - Have children listen to various environmental sounds. They can even match them to the pictures by pressing the "Shake" button. Auditory Bombardment - Create a board of images and words with a child's speech sound he or she is working on. Record the words to go with the pictures and have the child press the images to hear the sounds. Auditory Comprehension - Have children listen to a story on a grid. Then, ask them questions about the story. They can go back and press images to hear parts of the story again or use the part of their story as an answer. Expressive Language - Have children create their own story or a sentence to go along with a picture in the story. They can even record a story. Grammar - Create a grid about a certain grammatical concept. Use it as a flashcard-like way to learn grammatical concepts or press the "shake" button to have children find different grammatical concepts. Children can even match past and present tenses by dragging and dropping associated words together. Receptive Language - Create a grid with different vocabulary items and images for a student to learn. You can even create a story about a concept and have the student answer questions afterwards. Fluency/Voice - Have a student read a story aloud on the board using fluency/vocal strategies. He or she can play the recording back to hear how many errors he or she made. Social Stories - Create social stories on the application and have students read the social stories. Take pictures to go along with the social story, write text, and narrate the story. Emotions - Create a board of different emotions (or download the one the author created) to learn about different emotions. Press the "Shake" button to have students identify various emotions. Problem Solving - Create a board with different images of problematic situations and ask students how they would solve the problems. Have students match solutions to problems. 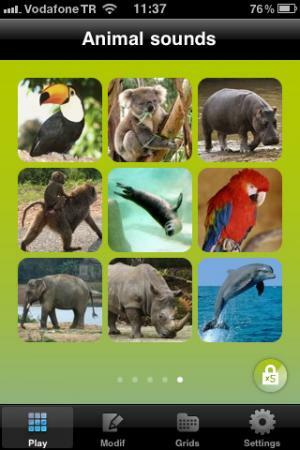 For all that is included and possible with this application, it is reasonably priced at $1.99 for the iPod Touch and iPhone (with an in-app upgrade to premium for $0.99) and $3.99 for the iPad (with $0.99 and free in-app purchases for more content). 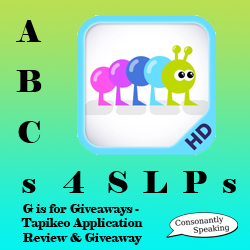 Consonantly Speaking was given an application code to give away with this review. In addition, the author of Consonantly Speaking writes for ReviewforDev (also created by Jean-Eudes Lepelletier). No other form of compensation was given. See below to enter the giveaway to win a copy of Tapikeo!